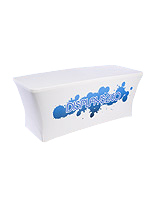 These Commercial Table Skirts On Sale Feature Custom Printing! These Tablecloths Stretch Across a Table for a Sleek Look! Stretchy table cloths creating a tidy and smooth appearance on any exhibit. Custom printed graphics on the front to add professionalism to your presentation. White cloth covers 3 sides of the table leaving the back open for additional storage. These table skirts, tablecloths need no pins or snaps to attach them to the moveable tables. The Poly-flex component of the tablecloths enables them to stretch and cover the entire table from top to bottom! In lieu of slouching like other table skirts and throws, this stretchy fabric fits snugly over any common 8' table without having to worry about wrinkles. The fabric covers three sides of the table, leaving the back open for staff members to sit as well as for easy access to hidden promotional materials that may be stored under the table. 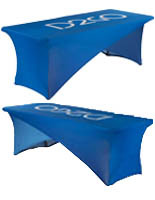 Embellish your trade show display with the assistance of these tablecloths. Our company sells these table skirts in a 6-foot dimension as well. 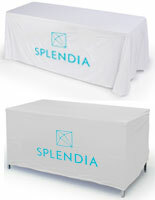 Produce an appealing exhibit at your next event or display with these tablecloths. These event linens, tablecloths can effortlessly change your dull tables into an appealing, professional artwork display that presents your business name, logo, or an image of what you sell. 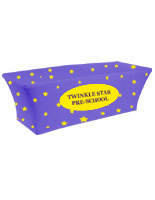 Advertise sales and conceal the mess with these concealing table skirts. These table skirts, also recognized as throws and covers, include full color, dye-sub graphics that stretches across the entire front panel of the skirting. These table skirts are perfect for every marketing venue that requires a tabletop display including seminars, trade shows, and job fairs.